What happens if the power goes out while you are using a power tool? 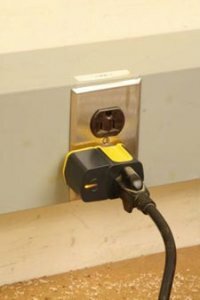 You probably set the tool down and head over to the power box to see what the problem is. You find that the breaker has been tripped so you reset it. There is one problem though, you forgot to turn off the tool you were using when the power went out. The tool powers on and cut into the project you have been working on for a week. The scenario above is just one example of what could happen, with injury being the worst. We would never have this problem if our brains worked at 100%, but sadly science has yet to discovery the secret to unlocking our brains. The next option is to use the SafetyGate. Its design and function are simple enough, yet so very handy and useful. If the power goes out, the SafetyGate prevents power from reaching and turning on your tool. To get the tool working again all you have to do is turn off the tool, then turn it back on again. The SafetyGate costs around $25. They have versions for both consumers and professionals.